Facebook chief Mark Zuckerberg’s highly anticipated debut as a congressional witness this week marks an unprecedented step in the company’s decade-long effort to wield influence in the nation’s capital. The social media titan is leaning on an expanding roster of well-connected lobbyists and message shapers at his company, as well as a team of outside consultants, to prepare for a host of questions from senators on Tuesday and House members Wednesday. Lawmakers plan to probe everything from a scandal involving Facebook users’ data to the secretive sources of campaign ads on the platform. Zuckerberg intends to approach an appearance Tuesday before the Senate Judiciary and Commerce, Science and Transportation committees, and House Energy and Commerce the following day, in a contrite and humble manner, say people familiar with the company’s preparations, who asked for anonymity to speak candidly about preparations. Though Zuckerberg has embraced, theoretically, some type of new regulation for his industry, lawmakers and tech policy lobbyists say they don’t expect federal legislation to move as a result of the high-profile hearings — and some are skeptical of what Facebook might actually support. “Absent new bombshells stemming from the hearings and investigations, new privacy legislation is very unlikely in the U.S. in 2018,” said Bruce Mehlman, a founder of the firm Mehlman Castagnetti Rosen & Thomas and an assistant Commerce secretary for technology policy in the George W. Bush administration. Europe already is moving on new privacy measures, though, and some state governments may well take them up now, too, Mehlman noted. Those come in response to the same scandal that prompted Zuckerberg&apos;s appearance: revelations that British-based Cambridge Analytica obtained Facebook data on potentially 70 million Americans to profile and then target potential voters. The firm has ties to the GOP megadonor Mercer family, which has funded campaign coffers supporting President Donald Trump. Zuckerberg was expected to arrive in Washington on Sunday evening, said a source familiar with his plans, to prepare for the congressional hearings. In addition to Facebook’s in-house lineup, a team from the law and lobbying firm WilmerHale, including its congressional investigations practice leader Reginald Brown, is spearheading the congressional testimony effort, said two sources with direct knowledge. Brown, an associate White House counsel in the George W. Bush administration, did not respond to a request for comment. WilmerHale was not among Facebook’s registered lobbying firms as of Friday, according to congressional disclosures. These bipartisan firms include a group from Steptoe & Johnson. James Barnette, the longtime general counsel at the House Energy and Commerce Committee, is among those at Steptoe & Johnson registered to represent Facebook. Facebook also has on retainer Luke Albee, a former chief of staff to Democratic Sens. Patrick J. Leahy of Vermont, who will take part in Tuesday’s questioning, and Virginia’s Mark Warner. 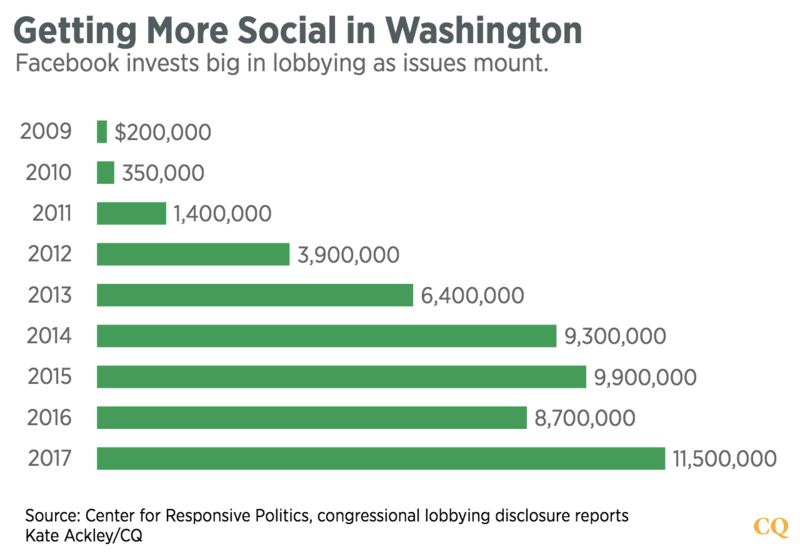 Facebook isn’t a newbie to lobbying, but it has sharply built up its presence inside the Beltway since 2009 when it disclosed spending just $200,000 on federal influence campaigns. It spent $11.5 million on lobbying in 2017, the most ever for the company, according to congressional lobbying disclosures. In 2012, the social media company was a founding member in launching the Internet Association, along with Google, Amazon and eBay. For comparison, Google spent $18 million on federal lobbying last year, the most of any individual corporation. Lobbying reports for activity covering the first three months of the year are not due to Congress until April 20. Facebook’s political action committee, which tilts slightly toward Republicans, is not among the top corporate PACs based on donations. It ranks 204th, according to the nonpartisan Center for Responsive Politics, which tracks campaign money and lobbying activity. Facebook&apos;s PAC so far has raised about $410,000 for the 2017-2018 cycle, and contributed about $384,000 to candidates. The company has given campaign contributions to senior members of the three committees that will question Zuckerberg, including House Energy and Commerce Committee Chairman Greg Walden, R-Ore., Senate Commerce Chairman John Thune, R-S.D., and Sen. Dianne Feinstein of California, the top Democrat on the Judiciary panel. Facebook is seeking to expand its Washington footprint and is advertising for D.C.-based jobs in communications, law and public policy. It also plans to move to bigger offices in the nation’s capital, in the heart of the Chinatown-Gallery Place neighborhood. Rep. John Sarbanes, a Democratic member of Energy and Commerce, said Facebook has mobilized its lobbyists. Sarbanes said he’s looking for substantive commitments from Zuckerberg, so Facebook users feel their personal data is safe and understand the sources of political persuasion efforts aimed at them on the social media platform. Bipartisan legislation aimed at the disclosure of online ads still may not move after the high-profile hearings, said Meredith McGehee, executive director of Issue One, which supports the measure. Zuckerberg on Friday announced two new efforts, one requiring advertisers of political or issue ads to be verified and another requiring people who manage pages with large followings to be verified. When it comes to privacy proposals, such as a bill by Rep. Marsha Blackburn, R-Tenn., that would require companies like Google and Facebook to get a user’s consent before sharing some data, Facebook has a record of pushing back. Ernesto Falcon, legislative counsel with the Electronic Frontier Foundation, an advocate for online privacy, says he’s skeptical Facebook will support new disclosures or tough privacy rules for the industry, based on his observations of the company’s lobbying in Sacramento. Working through the Internet Association, Facebook and Google launched an “11th hour opposition” to a cable and telephone privacy measure in September 2017, which did not pass, he said. For Facebook, the measure would have affected “nothing they have,” Falcon said, adding that the company worked behind the scenes to sow concerns. “They’re the big technology company that had nothing at stake, but it seems like the concern from them was the moment you raise standards for one set of industries, they’ll raise standards on them," he said. Falcon said he’ll be watching to see what Facebook does after the Zuckerberg hearings and how the company goes about implementing its pledge to make new European privacy standards global. — Alan K. Ota contributed to this report.